Denise Anne and I are getting ready to fire up the barbecue this Labor Day Weekend just like millions of other Americans. Chances are, though, most folks won’t be using the brand spanking new solar oven that my better half just got us. The oven looks like something NASA would send to Neptune to prowl one of its moons like Triton, with impressive metallic flaps designed to capture nuclear power. The source is the biggest nuclear fusion reactor within 93 million miles, the Sun. We’re all for nuclear power when it doesn’t meltdown, leave waste poisonous for thousands of years and is free. This oven heats just as hot as a conventional oven and about as fast, can’t burn the food, and is fume free which cuts down on volatile organic compounds when cooking carnitas and corn on the cob. No doubt Denise Anne and I will crack open a couple of Coca Cola’s and look back at the 45 days since we fired up EnviroReporter.com-v.2 on July 22. 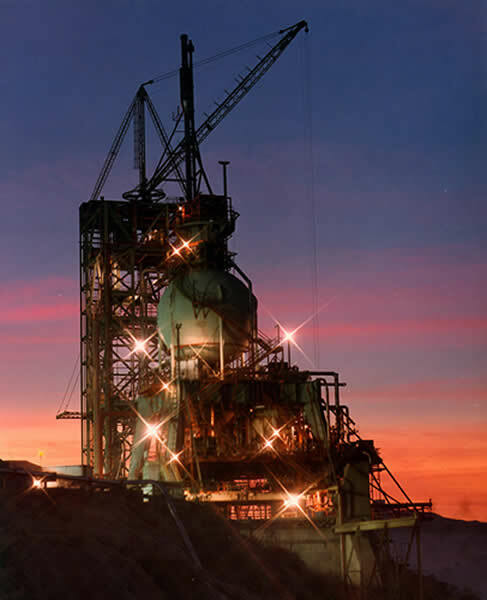 One of the best things about v.2 is its photographic platform and what better way to celebrate than with an amazing photo of the Coca I test stand at the Santa Susana Field Laboratory. Our friend at NASA, Merrilee Fellows, kindly imparted this historic and gorgeous photograph to EnviroReporter.com. The shot, with its intense rainbow sherbet-hued sky and starburst lights, shows where the Space Shuttle’s Main Engines were tested. Coca I, along with Coca II and Coca III, are in Area II of the lab that NASA controls. Coca is also part of RFI Group 4. RFI groupings, or Resource Conservation Recovery Act Facility Investigations, are areas of the lab that are characterized for contamination. Once this work is completed, the lead agency for the cleanup of lab, California EPA’s Department of Toxic Substances Control, under the new leadership of DTSC Project Manager Rick Brausch, solicits public comment before final approval of each RFI’s work plan. The Coca complex was involved with several missile programs including Navaho, Atlas, J-2, Saturn V second Stage Battleship (five J-2s), Space Shuttle Main Engine (SSME), and Delta IV Expendable Launch Vehicle Tanks. COCA I was activated July 1956 and conducted 244 tests. COCA II was activated November 1956 and ignited 127 rocket firings while COCA III was activated the month before and completed 102 tests. A newly configured COCA I went online in 1963 and conducted 320 Tests. COCA IV came online the same year but its tests records are not available. The current estimate of the amount of TCE in the lab’s groundwater is 800,000. Boeing’s onsite remediation capability of extracting the toxic vaporizing solvent is 10 gallons a year meaning that it would take 80,000 years to cleanse the water of TCE. The aerospace and defense manufacturing giant, however, turned off those so called “air-stripping” towers years ago. As we reported in the “Two Mile Island” sidebar article “Blinded by the Light,” at the Coca and Delta test stands, TCE was detected up to 50,000 parts per billion (ppb). California’s Maximum Contaminant Level for TCE in drinking water is 5 ppb. Vinyl Chloride in vapor was found up to 2,000 ppb. Now all this talk of toxins can make a person’s stomach start rumbling so if you’re wondering what we’re throwing on the sun oven barbecue; it’s the usual fare. It’s the dessert I’m looking forward to. Denise Anne doesn’t call me Rocket Man for nothing.